Kurei, not particularly pleased with the change of event, questioned Mikagami's identity. A man came in and reported that all the water in the pools was gone. Kurei sees the footage and suspected the maudough that Mikagami was using. Meanwhile, Mikagami sarcastically asked Recca, Fuko and Domon if they were challenging their strength against the wall. 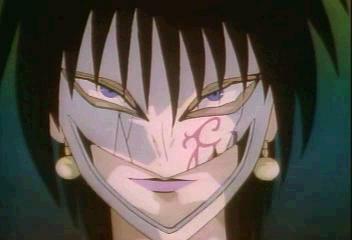 Fuko snapped at him in extreme annoyance, saying that he came here to have revenge on Recca because he had lost to him. Mikagami agreed with her as he held out Ensui but unexpectedly cut the wall to pieces. The falling pieces of wall made the trio scream as they shield themselves. But this scene had caught Kurei’s attention. Mikagami (using Domon and Recca as stepping-stones) stepped over to the other side, composed as ever. The trio yelled at him for nearly killing them but Mikagami quietly insulted them back – Domon as a gorilla, Fuko as a monkey and Recca as a mosquito and that such animals were useless. Ganko personally felt that even though Mikagami was handsome but his attitude was so cold. Koganei gave a surprise attack which Mikagami blocked perfectly. Koganei was impressed. Mikagami attacked him back. As Recca watched, he couldn't believe how skillful Mikagami was despite the fact that he has beaten him. Kurei confirmed his suspicion that Mikagami possessed the Hokage maudough, Ensui. However, his attention was still on Recca, who hadn't reveal his ability yet. As for Mokuren, he still had his craze in killing Fuko. Kurei finally gave him permission to do so. Back to the room, Koganei was so impressed with Mikagami that he asked him if he was the knight that Yanagi had mentioned. Mikagami said 'yes' which Recca protested intensely. Mikagami pointed Ensui at him and reminded him of the promise that he made back at the House of Mirrors. Their talk was interrupted by Koganei who wants to challenge Mikagami. Mikagami told them to hurry up and rescue Yanagi and if they want to thank him, they should thank Kage Houshi for sending him. In his mind, Mikagami admitted that Recca was the one that Yanagi wants to see. Koganei cursed but said that they won’t go far. On the way, the gang went through booby traps – trap doors, spikes and falling doors. During which, Recca released his flame, shocking Kurei completely. Kurei repeated the footage of Recca releasing his flame, meanwhile Yanagi’s screams are heard from behind. He stopped the experiment and demanded that Yanagi reveal the name of the guy who just used the flame. She replied that he was her friend. Kurei slapped her and questioned her fiercely. The frightened Yanagi said that she only know him by the name of Recca. At the word ‘Recca’, Kurei believed that fate had allowed him to meet someone whom he thought that he would never see 400 years ago. He uncontrollably laughed evilly. While Kogenai and Mikagami battled on, Koganei told him that his Anki Kougan had 5 faces, puzzling Mikagami. Moving on, the gang entered another room (how rooms did this mansion have anyway?) and met Kurei for the first time. The rash Recca attacked him but Kurei held his fiery arm without feeling any pain and threw him back. Recca sent another flame but once again, Kurei remained untouched and even extinguished it. Seeing that Recca had calmed down and was willing to talk, Kurei told them that he and Recca were born in the same era 400 years ago. During the process of uniting Japan, the shogun eliminates all the ninja clans because he feared the Hokage ninja due to their ability to create madoughs, which till today, modern science couldn't create. Through time, the maudoughs had been shattered all over the world and if he could collect all of them, imagine the power that he could obtain. The kidnap of Yanagi was done because his father, Mori Kougan desired immorality. Recca lost his temper and attacked Kurei who counter reacts with his own flame. Recca was stunned. Kurei explained that they are both descendants of the Hokage ninja clan and were sent to the present time. Recca would not remember since he was still a baby at that time. He clicked his fingers, the door trap beneath the gang opened. Everybody fell except Recca who grabbed hold of the edge. He was speechless that Kurei knew about Kage Houshi (the woman with 2 birthmarks on her chin). Before Recca fell into the basement, Kurei told him that if Recca could defeat the fighter (who was waiting at the basement) he would fight him.